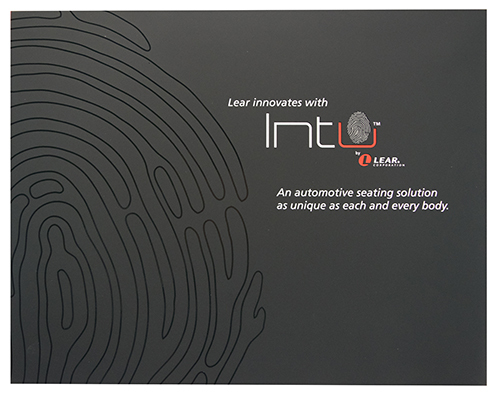 Lear needed a B2B development piece to highlight its long history and to get its customers and channel partners excited about the launch of its new seating technology. Lear was proud of its 100 year history and its recent move up the Fortune 500 list to #154. It also was launching its new seating technology and needed a strong B2B communications piece to highlight its impressive history and support its newest product launch. Lear partnered with Americhip to create a stylish Video Brochure all in black and augmented with gloss varnish highlights throughout. When opened, consumers were treated to our large 7” screen framed up within a graphical representation of a mobile device. Knowing so many of us receive our information and data these days through our mobile devices, Lear designed its Video in Print brochure to appear as though it had embedded a mobile device directly inside the brochure. Speak to your key consumers, channel partners and other core audiences in a visual language they will understand. Put Americhip’s patented Video Brochure Technology to work tell your story.